Ensure that intermodal chassis are roadable before the equipment is made available to the driver for transport. Intermodal Equipment Providers will be subject to on-site reviews to ensure compliance with the new rules. Penalties for violating these rules range from civil fines to a prohibition on providing or operating intermodal equipment found to pose an imminent hazard. Motor Carriers are required to inspect and report any Roadability Component Defect (s) (RCD) (see list below) to the IEP at the completion of each days work. C. Equipment Covered – All Chassis When used here, the term “chassis” and “Equipment” are used interchangeably. D. Affected Parties – Motor Carriers, Intermodal Equipment Providers, UPRR Maintenance and Repair Vendors. a) Equipment must be registered in IANA’s Global Intermodal Equipment Register (GIER). b) UPRR will assume that all IEP’s will use IANA’s System to prepare and transmit Driver Vehicle Inspection Reports (DVIR’s) unless otherwise advised and agreed upon. a) Must be registered in IANA’s Intermodal Driver Data Base (IDD). 1) Under the new Regulations, Federal and /or State Inspectors will have the right to audit our inspection, repair and maintenance records for RCD compliance. Effective June 30, 2010 the following Rules, Procedures, and Policies will govern the application of FMCSA regulations at Union Pacific Intermodal and UPRR CY Facilities. 1) At the time of In-Gate, all Drivers must report any Roadability Component Defect (RCD) (see list of RCD’s below). a) At AGS Gates, Gate Stands are programmed to accept this information via Key Pad. The Driver will be prompted for Yes or No to RCD. If Yes, the Driver will be further prompted for the specific RCD information.b) At Standard Gates, UPRR gate personnel will query the Driver verbally and record the information as outlined in 1a) above. 2) If no RCD to report, Drivers will declare “No RCD”. a) At AGS Gates, Gate Stands are programmed to accept this information via Key Pad. b) At Standard Gates, UPRR gate personnel will query the Driver verbally and record the RCD information. a) Date/time of gate transaction (system generated). b) Alpha-numeric equipment identification number (Electronic or gate personnel generated). c) Motor Carrier SCAC – (system generated). d) Driver’s license number/ license state (Biometric or gate personnel generated). e) Location of interchange (system generated).g) “No RCD” (Driver provided). f) “Yes RCD” RCD information (Driver provided). 4) UPRR will furnish the Driver with a copy of the J1 Interchange and Inspection Report with all Driver reported Roadability Component Defect(s). a) The reporting of RCD’s by the Driver is an in-gate reporting responsibility separate from Damage reporting. At Non-AGS Gates, Inspections will document other Non-RCD defects (Damages). 5) “No Roadability Component Defect” will be documented if no RCD’s are reported by the Driver. 6) UPRR will transmit the DVIR information collected at the in-gate to IANA or other Intermodal Equipment Provider’s (IEP’s) database, for DVIR completion. 7) IANA or the IEP’s database will prepare the DVIR and electronically transmit the completed DVIR to the registered IEP. 8) UPRR will automatically place all Equipment identified with RCD’s in bad order Hold status. 9) UPRR will not release Equipment from Hold (no outgate allowed) until the IEP or its Agent releases the equipment from bad order status. a) After the IEP or its Agent inspects and repairs equipment as may be required, IEP or its Agent will electronically certify by use of UPRR’s IIM Web based system that the Equipment has been inspected and or repaired. 2) If IANA Databases/Systems/Process is utilized, IANA will electronically transmit the DVIR information to UPRR ahead of actual In-Gate movement. a) UPRR will not accept DVIR information that is received after the actual in-gate date/time of the Equipment. 3) UPRR will hold this DVIR information in its computer system. When the equipment/unit arrives at the UPRR’s Facility, this DVIR information will automatically match the in gate record and produce an Equipment Inspection Report (EIR) documenting the RCD information to the Driver. a) If no Pre-In-gate DVIR reporting is available to the UPRR at the time of in-gate, Drivers will be prompted for RCD information as outlined in the Non-Virtual In-Gate process outlined above. 4) UPRR will automatically place all Equipment identified with RCD’s in bad order Hold status. 5) UPRR will not release equipment from Hold (no outgate allowed) until the IEP or its Agent releases the Equipment from bad order hold status. a) After the IEP or its Agent inspects and repairs Equipment as may be required, IEP or its Agent will electronically certify that chassis have been inspected and or repaired by use of UPRR’s IIM Web Based system. 1) Drivers are required to perform a pre trip inspection of all Equipment prior to taking Equipment onto the highway. a) UPRR will provide sufficient space for drivers to perform the required pre-trip inspection of the Equipment. b) Drivers will document these inspections and maintain them for their records. a) Operate the Equipment to the Roadability Lane. 3) Leave the Equipment on the Facility until repairs can be made. Equipment with any reported RCD will not be allowed to take the Equipment out the UPRR gate. RCD information will not be accepted at the time of out-gate. Driver will be sent back to the Roadability Lane for inspection and Repairs if required after the inspection. 1) Drivers may be stopped and inspected by Federal or State inspectors that may find RCD’s while the Driver is on the highway. 2) If a DVER is prepared by the Federal or State Inspector, then a copy of the DVER is required to be furnished to the Driver’s Motor Carrier. The Motor Carrier is required to transmit the DVER document to the appropriate IEP within 24 hours of receipt. 3) No DVER documents will be accepted or collected at UPRR’s gates regardless if the IEP is the UPRR or other Company. a) However, if the RCD is not repaired after the DVER was issued but prior to in-gate, the Driver is responsible to report a RCD using either the Virtual or Non-Virtual reporting as outlined above. 5) Upon receipt of the DVER by the Omaha Asset Team, the Omaha Asset Team will immediately enter a “DVER RCD Hold” in TCS for the specific chassis. 6) The DVER document will be held by our Asset Team for further handling as outlined below. 8) UPRR’s Mechanical Repair Vendor will review the daily TCS/Oasis “DVER RCD Hold” and arrange to prioritize the inspection and required repairs for the chassis for RCD’s. 9) The Omaha Mechanical Team will match the mechanical inspection and/or repair information with the DVER and send the completed report to the issuing agency within 15 days from the original inspection date by the issuing agency.a) A complete copy of the paperwork will be maintained by our Omaha Mechanical Team. The above procedures does not modify or negate any existing mechanical procedures in effect including the inspection, repair, and invoicing of damages and other repairs. UPRR’s Mechanical Repair Vendors will not handle inspections, repairs, or invoicing of RCD’s for chassis where UPRR is not the IEP. a) UPRR may share the same Mechanical Repair Vendor at geographic locations. However, each will have a separate contract with the foreign IEP’s and will be under the direction and control of the specific IEP who is registered in GIER. 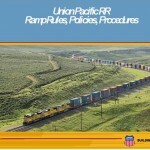 In compliance with the Roadability Requirements, as outlined in UPRRs Ramp Rules, Policies, and Procedures dated May 28, 2010, Union Pacific Railroad supports the following “Systematic Maintenance Program”. All UPRR chassis (i.e., UPRR is the IEP) must be inspected using the criteria outlined below. Inspections are required a minimum of every twelve months. All inspections/repairs must be reported through the Union Pacific electronic billing system with all required information. go/no go gauge for excessive wear. lock rings, clamps, nuts, and spacers. to insure they are not bent, broken, cracked. 5) Once the inspection/repair is completed, a decal containing the following information must be affixed the front bolster. a) Date and location of inspection and name of company performing inspection. 6) Inspection and Repair records will be maintained by UPRR’s Central Database at UPRR’s St. Louis, Illinois Facility. Intermodal Equipment Provider: Any person that interchanges intermodal equipment with a motor carrier pursuant to a written interchange agreement or has the contractual responsibility for the maintenance of the intermodal equipment. Intermodal Equipment: Trailing equipment that is used in the intermodal transportation of containers over public highways in interstate commerce, including trailers and chassis. Intermodal Equipment Interchange: The Uniform Intermodal Interchange and Facilities Access Agreement (UIIFA) or any other written document executed by an intermodal provider or its agent, the primary purpose of which is to establish the responsibility and liabilities of both parties with respect to the interchange of the intermodal equipment. Interchange: The act of providing intermodal equipment to a motor carrier pursuant to an intermodal equipment interchange agreement for the purpose of transporting the equipment for loading or unloading by any person or repositioning the equipment for the benefit of the equipment provider, but it does not include the leasing of equipment to a motor carrier for primary use in the motor carrier’s freight hauling operation.